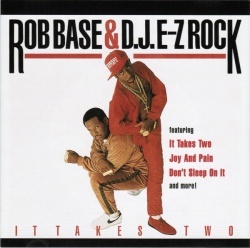 Best known for the multi-platinum 1988 hip-hop classic “It Takes Two,” Rob Base and partner DJ E-Z Rock rode the hit into dance clubs and, eventually, the Top 40 of the Billboard Hot 100, providing a touchstone for the style known as hip-house. After Base leapt several hurdles — including vicious rumors about his personal life, and a copyright infringement lawsuit filed by Maze‘s Frankie Beverly regarding the duo’s third single, “Joy and Pain” — he responded in 1989 with a solo album, The Incredible Base. None of the singles on that album had the force of “It Takes Two,” however, and the duo’s career subsequently went through more downs than ups. 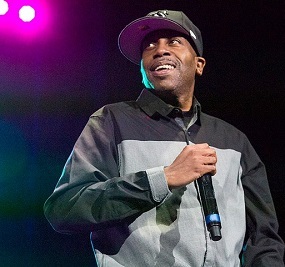 Born Robert Ginyard in Harlem, Rob Base began performing with a group called the Sureshot Seven while in fifth grade. By the time of high school graduation, the only members left were him and DJ E-Z Rock (b. Rodney Bryce, Harlem), so the duo began recording on their own. Their first track, “DJ Interview” — credited to only Rob Base as the artist, with co-production credits for E-Z Rock and Chill Will — appeared on World to World’s Fast Money compilation in 1986. Debut single “Make It Hot” was released on the same label in 1987, after which the duo signed with the larger Profile. The first Profile release, the title-track single from their debut album, It Takes Two, became a street sensation upon its release in mid-1988. Though the single barely reached the R&B Top 20 and the Hot 100 Top 40, massive club airplay enhanced its impact considerably. Both the single and album eventually went platinum, and Rob Base and DJ E-Z Rock were awarded Single of the Year by Spin. The second single, “Get on the Dance Floor,” continued the duo’s dance appeal, though his excellent rapping helped him retain his street credentials. By the end of 1989, however, Rob Base was on his own. His only explanation for the disappearance of DJ E-Z Rock was “personal problems.” The release of The Incredible Base in 1989 was a bit of a comedown; despite several interesting tracks, including a reworking of Edwin Starr‘s “War,” neither the album nor any singles connected with listeners. Base and E-Z Rock reunited for the 1994 album Break of Dawn, which didn’t make much of an impact. Base continued to perform through the 2010s but didn’t record another album, while E-Z Rock remained active as a DJ. E-Z Rock died of a diabetic seizure in 2014 and was honored later that year at the Hip Hop Hall of Fame ceremony.